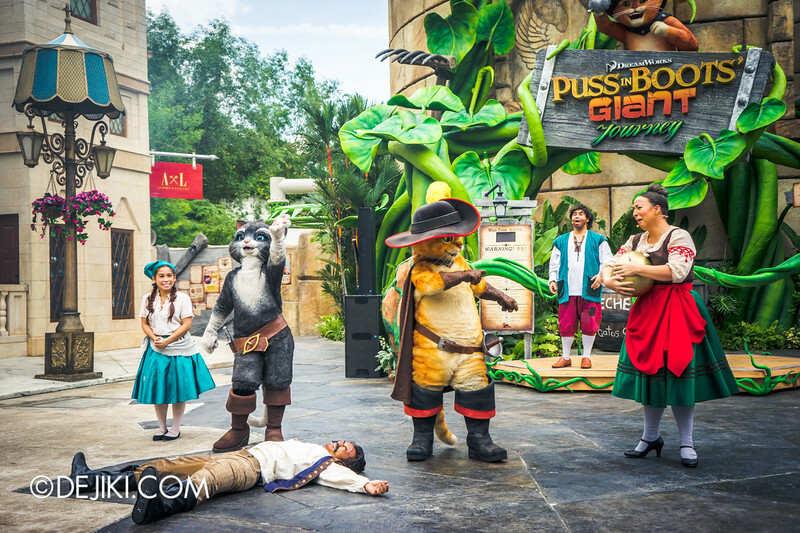 Universal Studios Singapore launched Puss in Boots’ Giant Journey with a special Grand Opening Ceremony Show on 8 April 2015. 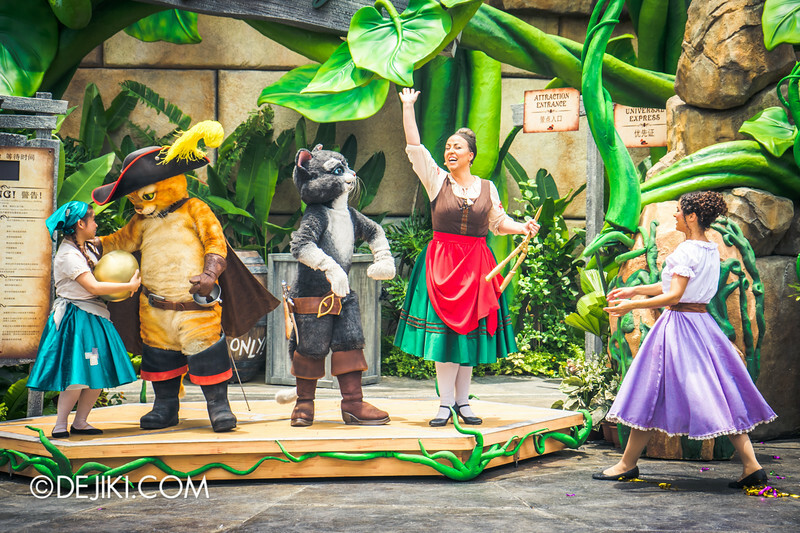 Relive the moments of the grand opening ceremony show in this photo tour, which stars Puss in Boots, Kitty Softpaws, Mama Imelda and more! 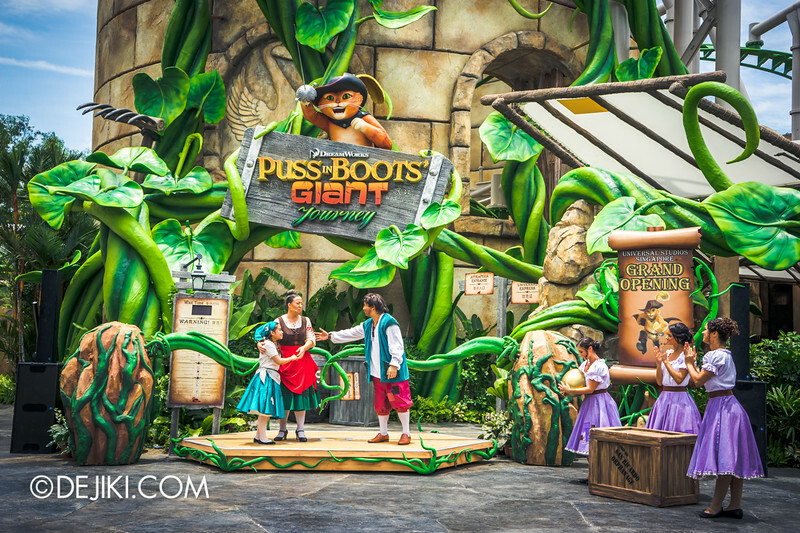 To celebrate the official opening of Puss in Boots’ Giant Journey, Universal Studios Singapore held a one-off show on 8 April 2015 in the park’s Far Far Away zone. 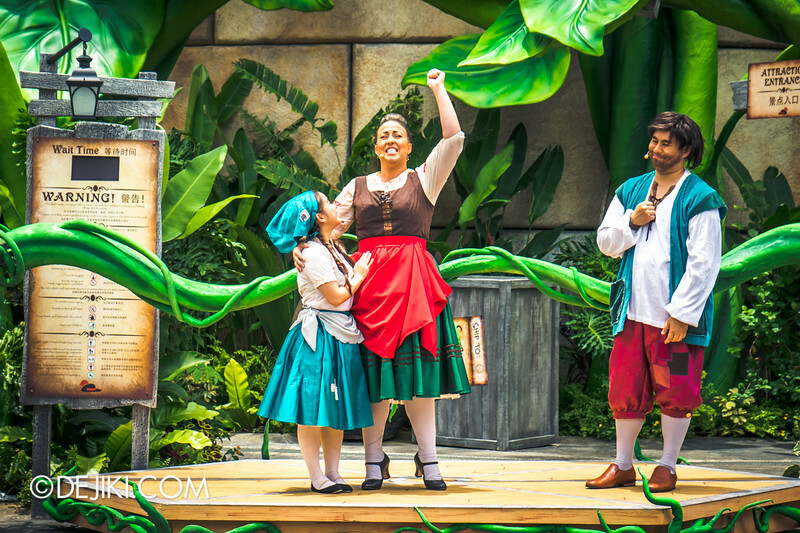 It was performed in front of the attraction and was open to all park guests who happened to be in the park that day. 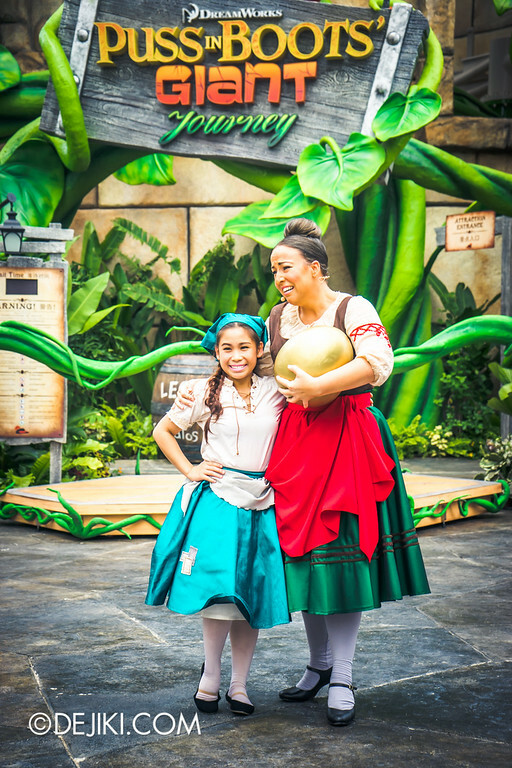 The show introduces Mama Imelda, who runs an orphanage in the town of San Ricardo. She is also Puss in Boots’ adoptive mother. Alejandro, the milk bartender, welcomes Mama Imelda to the park. Alejandro then invites the fearless felines to join in the ceremony. Kitty Softpaws arrives, but Puss in Boots is nowhere to be found. 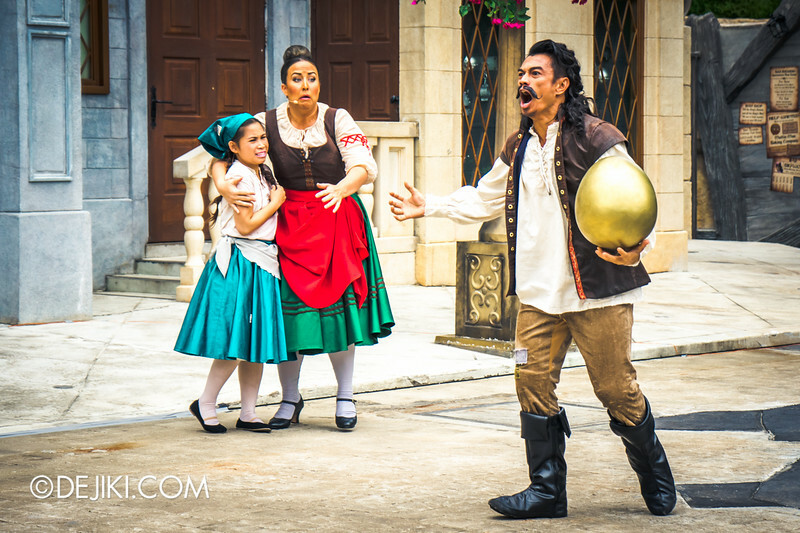 Meanwhile, several bandits made their way to the launch… and stole the golden eggs meant to help the orphanage! 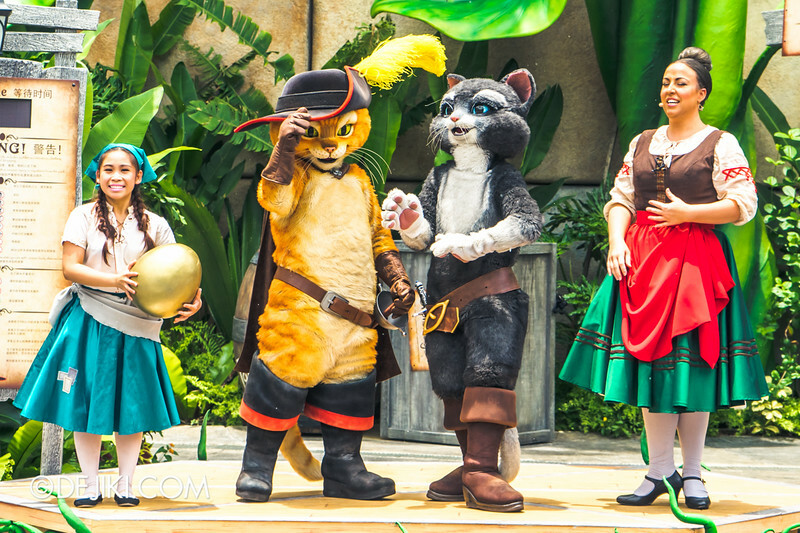 Puss arrives just in time to fight against the bandits, quickly recovering the golden eggs for Mama Imelda. And then it’s time to celebrate their victory! With the Orphanage saved, Alejandro invites Mama Imelda to launch the ride. 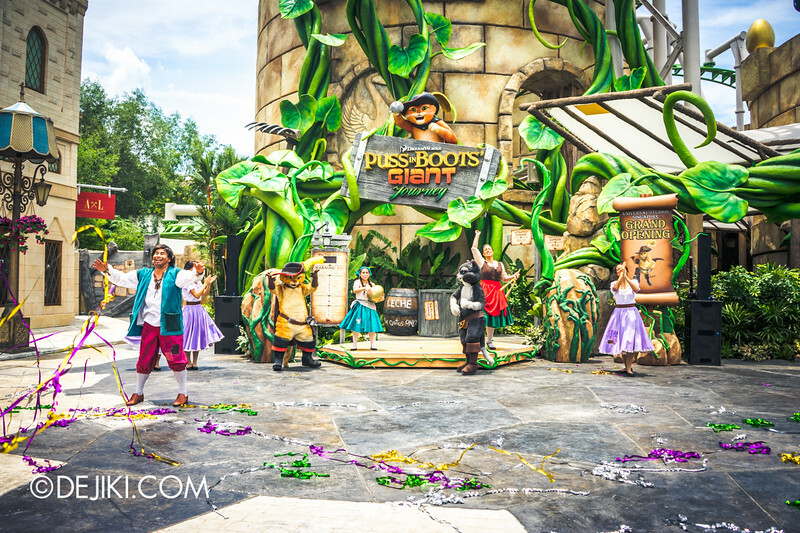 The vines magically lift up – Puss in Boots’ Giant Journey is officially opened! Featuring Puss in Boots, Kitty Softpaws, Mama Imelda and the villagers from San Ricardo! 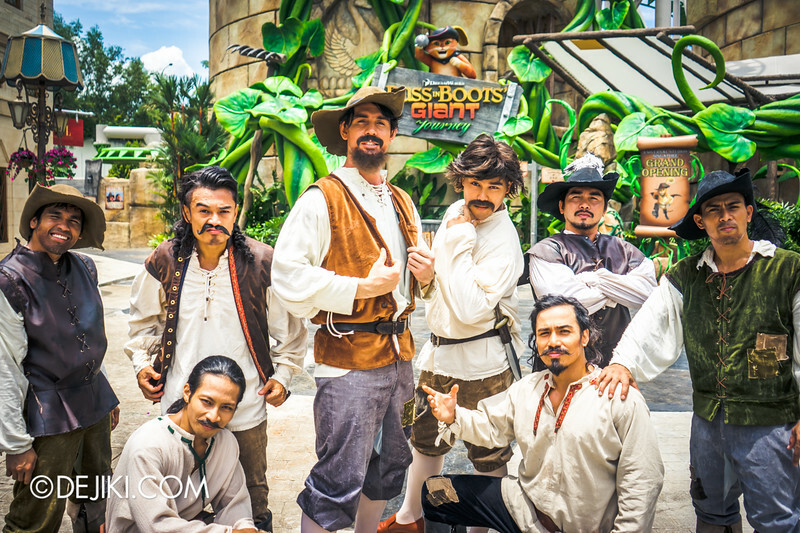 And let’s not forget the treasure hunters and bandits spotted around the giant’s castle.. Los Bandidos! It’s a shame that this performance will not be performed again. 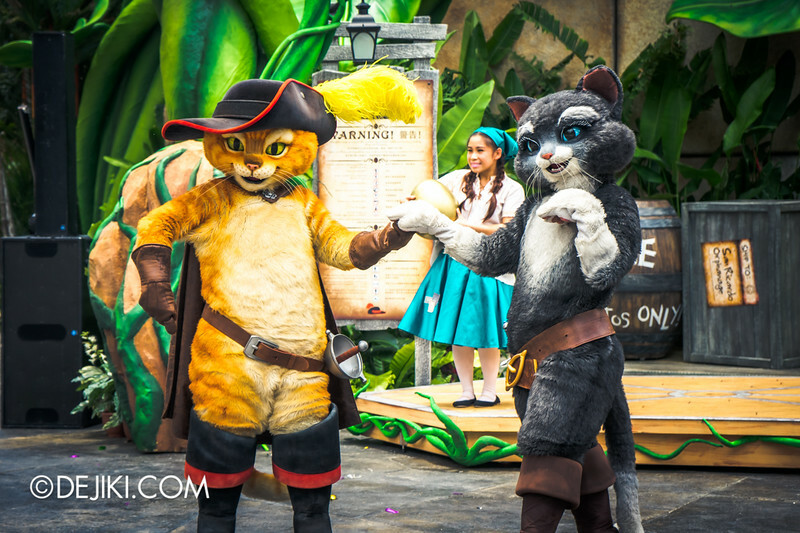 Perhaps someday we could see more characters from the Puss in Boots film series at the park’s parade and for Meet and Greet. 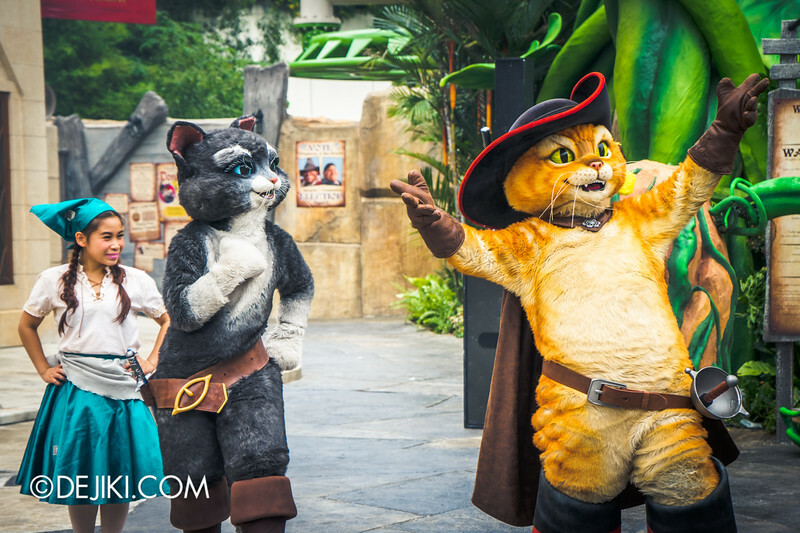 The adventures continue in Puss in Boots’ Giant Journey – the world’s first Puss in Boots themed roller coaster. 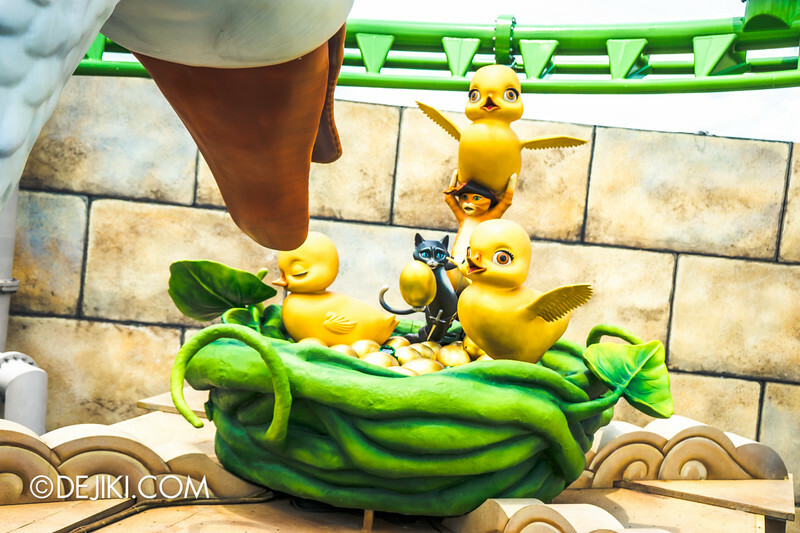 This ride is exclusive to Universal Studios Singapore and is the park’s newest attraction! Discover the ride here. Fantastic! This show should be adapted into a regualr park offering! It’s better than The Dance For The Magic Beans, in my opinion. It definitely has more action for sure. I also saw some familiar faces hahaha. 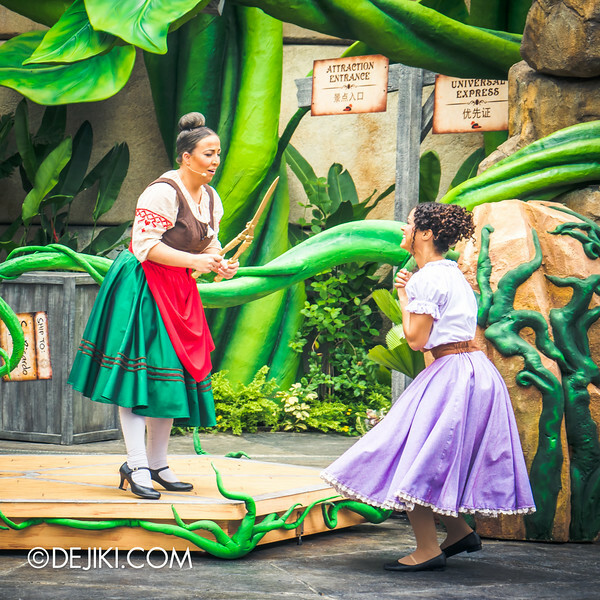 I think at least two of the three ladies in purple play the Nile Princess, and Mama Imelda is also Isabella the Milk Bartender and Lady Florentine (I think)! That’s right! 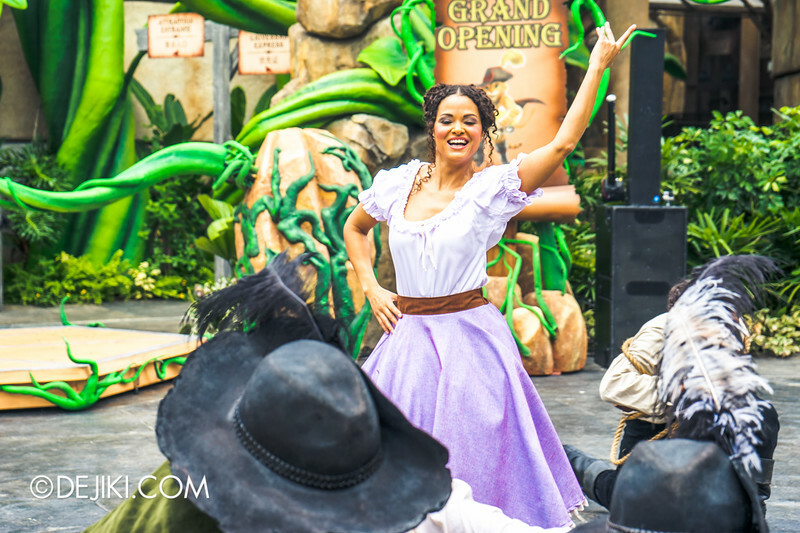 The park’s talented cast members take on many roles in various shows and attractions. 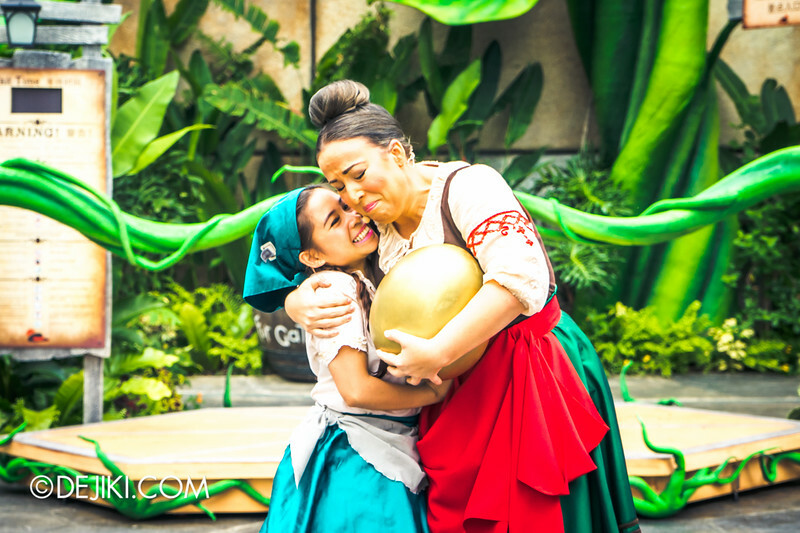 You might’ve met ‘Mama Imelda’ as Dr. Rodney in Jurassic Park; the host of Donkey Live; and even as Reporter Marianne Green at Halloween Horror Nights 4! Yes I have met her as Dr Rodney, but not as the Donkey Live Host yet. 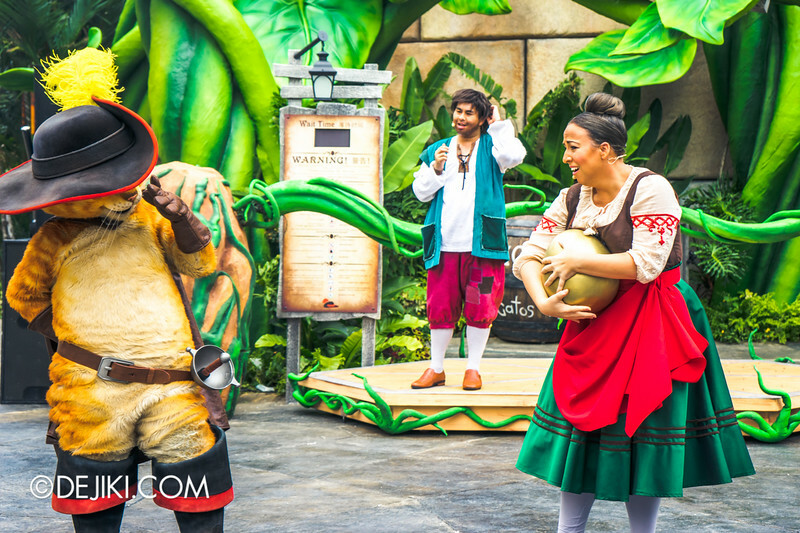 To be fair, I rarely ever go for Donkey Live. And yes, I may have seen her as Marianne Green during the opening scaremony but I didn’t realise it until later. Reading your previous Halloween Horror Nights posts, I also realise she might have been the housing agent you described as reminding you of Amy from the Ellen Show! Love the GIF!! Hahahaha! They add this into their daily shows! Great entry!